What Is It That Makes A Man Take Up Morris Dancing? Firstly is the wish to get off ones backside and enjoy life! Something that has been enjoyed for generations is perhaps a good place to start! You meet great company from all walks of life, Rich to Poor, Plutocrats to Plough Boys ~ all have a common wish, to have a good time & keep our own Traditions alive! 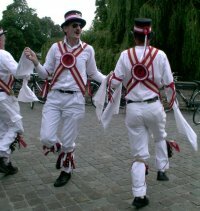 Morris dancing has its own self-enjoyment but it is also for the enjoyment of others. People who are not so able to enjoy a full life (& many that are!) tell us that seeing the Morris gives them a great lift. Then there is the music and the songs. 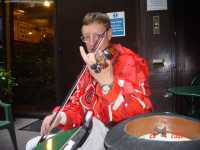 Meeting up for an evening, rolling out a few songs and tunes in a local pub makes any pub a homely and warm place. Morris Dancing is as much an English traditional as Roast Beef! (See Origins) Its popularity may come and go but it never has and never must, die out. All cultures need their roots. Your support is essential. With Folk Dancing a part of every nations culture, Morris Dancing is an International passport. It has been said that Morris Men rather enjoy their ale, well it’s true they do, but they also enjoy convivial atmosphere and company, and sampling the excellent ales, though heartily recommended & an absolute joy ~ is not really compulsory!